To start 2019 off with a bang we’re getting seriously automated with our latest integration partner the magnificent Automate.io. We’re a bunch of people who believe that the apps should be doing all the hard work and we (humans) should only be doing the smart work. Modern-day apps are Awesome. They do a great job in doing what they are meant to do. But as we start using more and more of these apps, things start to get messy. It is precisely this problem that we solve. Our Mission: Help people work smart. And we at ClickSend HQ love any company, brand or product that helps people work smarter. Automate puts your business on autopilot. You can integrate your cloud applications and automate marketing, sales and business processes in a few simple clicks. Send automated emails, run drip campaigns. Automate social and mobile messages, run smart twitter campaigns. Streamline sales process, automate follow-ups, assign tasks, track and score leads. Put your CRM on steroids. Sync orders and payments to your invoicing app. Automatically create and send invoices, track payment and send reminders. Setup cross-functional workflows in minutes. Automate any business processes across apps. Get things done faster. 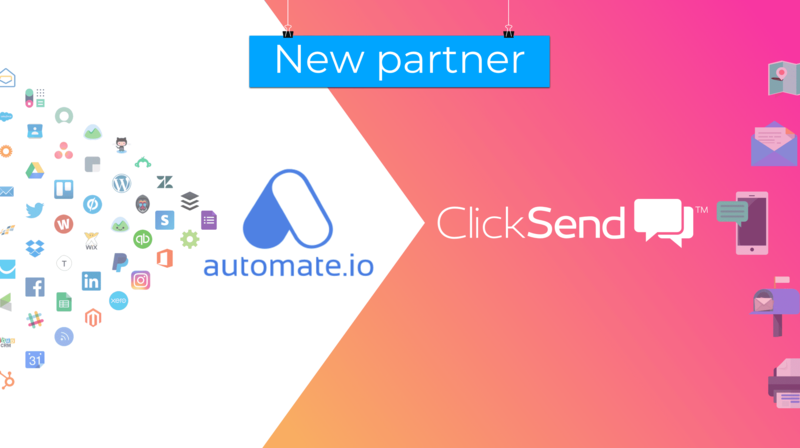 With Automate.io you can connect ClickSend to lead capture form, marketing, sales, project management and collaboration, apps. You can react quickly and stay alerted whenever something happens in any of your business app via an SMS. Automatically trigger SMS to leads from any lead generation forms like Facebook lead ads, Typeform, Wufoo, Jotform, Google Forms etc.